I'm sorry to hear the St. Petersburg Times bicycle blog, Spoke-N-Word, authored by my blogging compatriot Adam Newman, is being merged into another Times blog called, "personalbest," which covers health and fitness. That blog's link is http://blogs.tampabay.com/health/. The Times is consolidating blogs and it seems that a bicycle blog is not as popular as other Times blogs on stuff like the Bucs and local news. 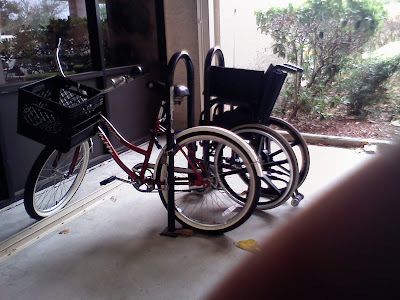 I have visited a lot of downtown buildings with a bicycle in Tampa and many other cities and it's often the case the building manager gives you a frosty reception if ask to securely store and lock the bike inside the building. Forget about bringing the bicycle inside and I'm often relegated to finding some utility pole on the sidewalk to lock up the bike. People can mess with the bike -- and rainy weather can mess up the bike, too. But not at the Tampa City Center building at Jackson and Franklin. Building manager Sandy Ballestra showed me the spacious storage rooms -- yes, plural as in two rooms -- where bike commuters who work in the Tampa City Center can safely park their bikes and not worry about anyone messing with it. And there's even this backroom that Sandy showed me. I met Sandy at a bike commuters meeting at the HOK offices on the 18th floor. Several HOK employees met with the local bike gang of Karen Kress, Jim Shirk, David Luppino, Karla Price, myself etc. to see what can be done to enhance bike-commuting and bicycling in the downtown Tampa area. I just looked at the 2007 national road stats on fatalities and injuries -- and Florida wins the dubious bicyclist fatality "award" again for having the highest bicyclist fatality rate in the country and also having the highest raw number of bicyclists killed in 2007. Florida had 119 bicyclists killed in 2007 -- tops in the country. Second was California with 109 bicyclist fatalities even though California has twice the population of Florida. The total number of bicyclists killed in the country was 698 in 2007. Florida had 28 percent of all the bicyclist fatalities in the U.S. in '07. Florida also had 6.52 bicyclists killed per million population -- about three times the national average of 2.31. Second and third behind Florida in bicyclist fatality rates were Louisiana at 5.12 and South Carolina at 4.54 per million. The numbers are from the National Highway Traffic Safety Administration (NHTSA). They were sent to me by Jeanette Rouse at the local DOT office. In 2007, 698 bicyclists were killed and another 44,000 were injured nationwide. The highest number of bicyclists killed in the country was 1,003 in 1975 and there were 814 bicyclists killed in 1997. Bicyclists accounted for 13 percent of all nonoccupant traffic fatalities in 2007 and the 698 bicyclist deaths accounted for 2 percent of the 41,049 traffic fatalities nationwide during the year. One-seventh -- 15 percent -- of all the bicyclists killed in traffic crashes in '07 were kids between 5 and 15. Alcohol involvement -- either for the driver or the bicyclist -- was reported in more than one-third of the traffic crashes that resulted in bicyclist fatalities nationwide. Five states did not have a single bicyclist killed in 2007: Delaware, Wyoming, North Dakota, South Dakota and Vermont. More than 52,000 bicyclists have been killed in the U.S. since 1932, the first year that estimates of bicyclist fatalities were recorded. Here's the sad story of a cyclist in Virginia killed by a driver..
BOCA RATON - A man riding his bicycle home from Delray Beach around 1 a.m. was attacked by men who jumped out a car in the 2600 block of North Federal Highway, police said. The suspects pulled alongside the bicyclist jumped out and hit him on the arm with a baseball bat, he told police. A second man hit him on the head and others tried to take his backpack, police said. They were unsuccessful and took off when another car was approaching, police said. Police ask anyone with information on this crime to call Detective Juan Carlos Pijuan, 561-338-1387 or Crime Stoppers, 800-458-8477. This afternoon I talked SWFBUD and bicycling at the Eco-lution event in downtown Tampa, handing out fliers for the Bicycle Bash by the Bay and chatting bicycling with anyone who stopped by the SWFBUD table. It was a pleasant event, kind of a dressed-up Earth Day event where the people who showed up already shared the green view on life. The Urban Charrette and its "Agents of Change" put on the Eco-Lution event. The Urban Charette is mostly architects, planners, designers and generally hip greenies who feel Tampa can do a better job at building a more efficient city of more interesting, better-designed buildings, integrated transportation modes besides cars and an overall imrpoved development strategy that would improve our quality of life. That's where bicycling comes in. Any great city is a bicycle-friendly city that has multiple ways to get around besides a car. I was hoping for a little more people to attend the event today, but overall it was a nice-looking event. Kudos to Urban Charrette organizers Adam and Taryn for their efforts and vision of creating a better Tampa. During the Bicycle Leadership Conference last week in California, I had the chance to meet Judy Amabile, who owns the company that makes the Polar Bottle. I like Polar Bottles and I mentioned to Judy that about 10 years ago I had one of the Polar Bottles crack. Judy told me that any cracked Polar water bottles would be replaced for free. So, I took her up on her company's policy. A new Polar Bottle arrived in the mail today and I want to give a shout out to Judy and Polar Bottle. What was also refreshing was that a live human being answers the phone at the Polar Bottle headquarters in Boulder, Co. when I called to gime address, so kudos to Judy for excellent customer service. 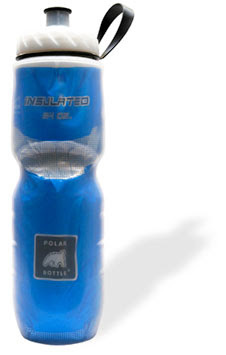 I hope Polar Bottle can participate in the 2009 Bicycle Bash by the Bay. Keeping water cooler in the hot environs around here is important. TAMPA — Local cyclists are a diverse community — not just the stereotypical weekend warriors clad in spandex. To tout their many shades and to advocate for openness, riders of all types will hop on beach cruisers, fixed gears, mountain bikes and more Sunday, as part of Tampa's first "Queer Mass." The slow moving ride will be modeled after a "critical mass," in which a group of riders take over a lane of traffic. The idea is to raise awareness, letting cars know that cyclists have the right to be on the road. Queer Mass, however has a more focused aim: gathering people from the gay, bisexual, transgendered and lesbian communities, along with supporters, to let them know that there is a place for them among cyclists. "It is about accepting everyone but also about creating a specifically queer positive space," says event organizer Seven Mitchell. Keith Sherwood of Tampa Heights has a bike but only takes it out once or twice a month. He says he's never been on an organized ride before but plans on attending the Queer Mass. "I think it's a great idea," he said. "A queer positive ride, without being a protest. It helps the sense of community." Riders will meet at Tampa Bike Co-op Space, 2512 Silver Lake Ave., and leave at 6:30 p.m. Cyclists will snake through downtown, into Channelside, Ybor and back. Members of the Tampa Bike Co-op meet monthly and host bicycle repair workshops. The group wants to give more people access to cycling by teaching them how to repair their own bikes. Mitchell, a graduate student in anthropology at the University of South Florida, has been active in the Tampa bicycle community for nearly two years and is a regular at the co-op. He says the ride is open to anyone who is pro-equality. "I want this to be about acceptance," he said. "It's bigger than just sexuality." Earlier this month, the Florida Bicycle Association visited state legislators to spread the word about bicycling in Florida. The Tallahassee paper did a story about the visit. And check out some of the comments at the end of the story. Some hostile drivers out there who don't know how to play nice with bicyclists. From the League of American Bicyclists via a bikingbis tweet. This morning the Tampa City Council held a workshop that included discussion on stimulus money of $32 million that apparently is coming the city's way and green jobs. So more than a dozen folks in the Tampa community came out to urge the city to spend the money on environmental jobs that would make Tampa a more "green" place to live. Several city council members seemed annoyed that city staff didn't seem to know the exact process of getting and spending the money, with the chief city employee on the subject explaining she would get back to the council. I spoke before the Council on behalf of SWFBUD, urging the city of Tampa to create green jobs and spend money on green projects such as widening roads to make them available to cyclists and pedestrians not just cars; and integrating bicycling into all aspects of city infrastrcuture such as secure bike areas in downtown areas and workplaces. Bicycling is just one part of the green movement and SWFBUD urges Tampa Bay area governments to think holistically about blending bicycling into their infrastructure systems. Tampa Bay is a mixed bag of bicycle conditions -- and bicyclists. Like this pair I bumped into during the last few days in the Seminole Heights area. As much as I love bicyclists there are always knuckleheads like this guy. He's crossing an intersection at Nebraska and Hillsborough before he has the green light -- in fact he's crossing with a turn arrow guiding traffic from the opposite lane right into a broadside accident scenario. Plus he's wearing earphones in traffic -- and the no helmet is the least of his problems. (It doesn't help that a driver at the red light is in the crosswalk that he's using). Then you have this bicyclist on a road bike and with a helmet, biking with traffic down 12th Street south of Sligh Avenue. Where Did the Share the Road Sign Go On Rowlett Park Drive? There used to be a Share The Road Sign at this site along Rowlett Park Drive. About three years ago, SWFBUD convinced the city of Tampa to put Share the Road signs on both sides of Rowlett Park Drive because the road that crosses the Hillsborough Avenue and helps get bicyclists to the University of South Florida campus. But as you see, the Share the Road sign is gone. Roy LaMotte, the city's transportation director, approved the Share the Road signs at the time. 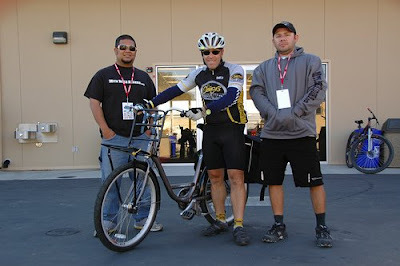 At the Sea Otter Classic, I had a wonderful time hanging with RL Policar and his pals at www.bikecommuters.com, a wonderful bike-commuter Web site that includes our own Jack "Ghost Rider" Sweeney here in Tampa. RL did a fun post on the web site. For a full list of the bike stores from around the country that won Bicycle Retailer and Industry News awards, check this out. Here's Reba, my pal and the best crossing guard in the crossing guard biz. Bicycling Benefit No. 738: Making connections with people during bike rides. Reba is a crossing guard near the Stephen Foster Elementary School in Tampa. Back in Florida now and I received a wonderful photo from one of the unofficial Bicycle Stories correspondents, Picot Floyd of Seminole Heights. Welcome to your average bicycle rack in the Sunshine State. I'm back in Tampa and breezing through the photos from the Sea Otter Classic from the hills outside Monterey brought back pleasant memories of a wonderful few days in California. It's northern California that gave birth to mountain biking and the Sea Otter Classic has grown into one of the premier all-around fun bicycle events in the country. Four days of bicycle racing, events and velo-loving. You mean Clif Bar has an energy bar? I thought they are a beer glass manufacturer. David and Tammy sold Tour de France caps and T-shirts. The kids had a grand time. Lots of fun people and fun bikes. On Saturday night, the Bicycle Leadership Conference ended with a terrific dinner on Cannery Row in Monterey. Ken Grossman, the founder of the Sierra Nevada Brewing Co., was the guest speaker and showed a great slide show, which included this beauty of a bicycling bar. An incredible bicycle conference in Monterey ended with a nice photo with Ken. Beer and bicycling -- a lovely match. OK, now I see why beer is so popular in the bicycle world.